Message: I have used alcohol inks to paint on silk and wonder how best to fix the dye. I used a water based resist and would like to wash it out in water but am afraid the water will wash out the ink before it is set. I could iron but wonder if you recommend a fixative. I’m afraid I don’t have the answer you’re looking for. Alcohol inks are not suitable for painting silk that will ever be subjected to the rigors of washing. They are intended for coloring materials that will never be laundered; for example, they are good for painting fabric that you are then going to frame and use as decor, or for painting wood, glass, or metal ornaments. There is no fixative that will enable the alcohol inks to function as real dyes. There is a way that you might fix it permanently in place using a colorless fabric paint, but the results may or may not be what you’re looking for. The biggest problem is that anything you can use to fix your alcohol inks will also fix the resist in place! It is important to use the right material for a project. For painting on silk, I recommend using good silk paints or silk painting dyes. There are many excellent choices available. Take a look at the silk painting section at a good dye supplier. For example, see Dharma Trading Company’s page of “Paints and Dyes for Painting Silk, Wool, and Nylon Fabrics“. Every one of the dyes and paints on that page is far more suitable for silk painting than are the alcohol inks. It would be good to start by reading some books about silk painting, such as Susan Moyer’s Silk Painting for Fashion and Fine Art, or Mandy Southan’s Beginner’s Guide to Silk Painting. There are some differences between silk painting and watercolor painting on paper. Very nearly as beautiful are the results produced with silk paints, which are fixed by ironing. The effects are very similar to those of silk dyes. They contain pigments, rather than dyes; a pigment must be attached to the fabric by a fine glue-like binder, which is included in the paint. Usually the binder is one that is activated by high heart, such as by ironing to heat-set. Alcohol inks are missing this binder component. You can get lovely results by painting with a specially-made silk paint such as Pebeo Setasilk or Jacquard Products’ Dye-Na-Flow fabric paint. PRO Chemical & Dye sells a similar silk paint called PRO Silk & Fabric Paint. Fabric paints always leave at least a slightly perceptible change in the feel of the silk, unlike silk painting dyes, but the convenience of not having to use extensive steaming (in a silk steamer) to set the dye causes a great many artists to prefer it. Silk paints leave a much less noticeable change in the hand of the fabric than do other textile paints. Some water-based resists that you can use with silk paints will be fixed in place by heat-setting, while other will wash out easily even after ironing. Silk paints themselves can be used as a water-based resist for steam-set silk dyes, but they can’t be expected to wash out 100%. Now you know what you should use next time, but how are you to salvage this current project? The first and most effective option is to preserve it by never washing it, and retain the resist that you used exactly as it is now. There is no guarantee that anything else that you try will work out satisfactorily. If never washing your painted silk is not an option, you can TRY to set the pigments in place using a clear, colorless fabric paint or fabric medium; this will inevitably fix anything else on the fabric in place permanently, as well, though, whether it is a resist or a random fleck of dirt. Dharma Trading Company (and other Jacquard Products suppliers) sells a fabric medium they call “Lumiere and Neopaque Extender” in containers ranging in size from two ounces to one gallon; the same product is listed elsewhere as listed elsewhere as Jacquard Products Neopaque Flowable Extender. This is the exact same material as the fabric paints that have colors, but without the pigments. You can dilute this material by no more than one-quarter with water (e.g., mix one ounce of the clear extender with one-quarter of an ounce of water); using more water interferes with its effectiveness at holding the pigment in place on the fabric. It is always essential to test your materials and methods before spending much time and material on using them. Since you have already obtained a design that you do not want to spoil, you would need to test whether fixing it with fabric paint extender will work, or whether it will ruin what you have. Create a small quick test painting using the same inks and resist material, one that is similar in application method to your current design, on a piece of scrap silk, and do a test of the following method. Given the wide variety of things that different people will try, nobody can guarantee that a material will work the way you want it to with what you already have; you must always do a test first to see how you like the way the materials work together. 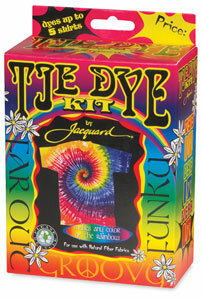 To use the fabric paint extender to try to make your alcohol ink design permanent on silk, you would paint your design, after it is completely dry, with Lumiere and Neopaque Extender on both the front and the back side of the fabric (letting the fabric dry before turning it over to do the second side). Be very careful, as the liquid in the extender might lift some of the pigment, distorting your design. After the extender you have applied has been dry to the touch for 24 hours, you can heat-set it to make it permanent. You can do this by pressing, according to the manufacturer’s instructions, with a hot iron for thirty seconds on each side, or by putting it in a commercial clothes dryer for an hour (home clothes dryers do not get hot enough). If heat-setting is impossible, some artists have reported that allowing the fabric paint to dry and cure at room temperature for a long period of time, more than one month, seems to produce an adequate degree permanence, as well, though this is not among the manufacturer’s recommendations and might not work as well. There are other brands of fabric paint medium that might be used for this purpose, as well. In her 2008 book “Quilts of a Different Color“, published by the American Quilter’s Society in Kentucky, Irena Bluhm gives a recipe for a mixture of colorless fabric mediums that she uses to seal pigment she has drawn with ordinary colored pencils onto fabric, which she then uses for quilting. Her favorite formula is to mix 70% Jo Sonja’s Textile Medium, 20% Delta Ceramcoat Textile Medium, and 10% Versatex Fixer. The different textile mediums have different textures, and it is a matter of taste, which you prefer. Delta Ceramcoat is very thick, while Jo Sonja’s Textile Medium is thinner. These two textile mediums require heat setting, but the Versatex Fixer allows the use of this mixture with no heat setting at all. The combination of mediums with fixer must be used immediately after the Versatex Fixer has been mixed into it. Remember that using a fabric paint extender or fabric medium in this way, in order to fix a non-permanent pigment that was never intended for permanent use on fabric to be washed, can only be regarded as experimental. How successful it will be will vary depending on the performance of the specific ink that you used, and also depending on other variables such as how thickly the ink was applied, how sturdy the silk is, or on how frequently you plan to clean it. As far as I know, there is no method that has been tested and shown to nearly always be acceptable for permanently fixing whatever brand of alcohol ink you used on silk. If this particular piece is precious to you, it would be best to save it as it is now, without washing out the resist, and to immediately invest in a proper silk paints or silk painting dyes for your next project on silk. I’m sorry I don’t have a way that will allow you to wash out the resist without damaging the alcohol ink painting. This entry was posted in fabric paints and pigments, fixing dye, silk painting on November 9, 2017 by pburch. Message: I’m doing research on pre-reduced indigo crystals. I’m finding that they’re being called everything from freeze-dried to instant and claims of them being ‘natural’, extract, etc. This flies in the face of what I’ve also been told directly by an importer- if it comes from India it’s all synthetic. Even the stuff one seller is claiming produced in Japan has an import label from India! So you can see confusion. Any information or insight you’d be nice enough to share is most appreciated. 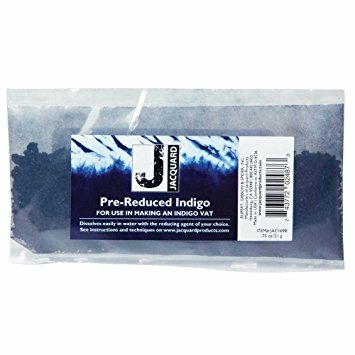 I believe that I’ve NEVER encountered pre-reduced indigo that was not synthetic. Those who wish to use only plant-derived indigo must do more work to reduce their indigo themselves. As an alternative, try this Pre-reduced Indigo. Synthetic Indigo (chemically identical to natural Indigo) has been pre-reduced chemically, then dried, so it dissolves in water right off the bat….This all makes it have a lower environmental impact for the dyer than taking the original natural or synthetic Indigo from start to finish with all the chemicals involved. “Organic” is a difficult word for the dyer, because an organic chemical is any chemical that contains carbon; it has nothing to do with organic farming. All dyes, whether natural or synthetic, are organic chemicals, aside from a few mineral colors that are not really of interest. However, many dyers mistake claims that a dye is organic, thinking it means it is a plant-derived dye when in fact it is not. Dye sellers sometimes purposefully exploit this confusion. Jacquard pre-reduced indigo is available through Amazon, as well as other sources; a supplier on Amazon currently selling Jacquard pre-reduced indigo, “The BT Group”, provides misleading information claiming that what they are selling is naturally occurring. There’s an issue with resellers on Amazon, which can post wrong information about their products; it’s likely that The BT Group doesn’t know anything about what they are selling, and merely selected several phrases from the Jacquard copy without paying attention to how they have changed the meaning by omitting a key word. Similarly, Etsy sellers give blatantly false information about whether the pre-reduced indigo dye they sell is from natural sources, when what they are selling is obviously synthetic, given their suppliers. Earth Guild makes an error, showing instructions for using natural indigo on a page whose title is “PRE-REDUCED INDIGO INSTRUCTIONS”, but I don’t think that the title of a web page amounts to a claim, given that many people who edit web pages don’t even know how to alter the titles of their pages. (source) In corroboration of this interpretation, they have a page on Lanaset dyes with this same webpage title, so it’s just a mistake. There are blogs that have instructions for using pre-reduced indigo which assert that the dye is natural, but in every case it seems that the blogger was insufficiently knowledgeable. Since they’re not selling the dye, they’re not legally liable for their claims in the same way that someone who is selling a pre-reduced indigo is. If you find any additional information, I will be interested in learning about it! This synthetic pre-reduced indigo contains the same indigo molecule as natural plant-derived indigo, although, like all pre-reduced indigo, it is prepared from synthetic sources. Unlike the usual oxidized form of indigo, pre-reduced indigo is soluble in water, saving you trouble when preparing it for dyeing. This entry was posted in about dyes, vat dyes and tagged indigo, natural, synthetic on November 2, 2017 by pburch.